The first thing Daniel does when he wakes up every morning is set positive affirmations, meditate, and pray. Then he heads to the gym, always using his AMPED™ products before and after his workout. He comes home and begins his day, focusing his attention on his business and his family. However, life wasn’t always like this for him. Before entering the Army, Daniel lost his older brother in Afghanistan and endured many hardships while serving as an airborne ranger. When he left the military in 2015, he wasn’t himself and needed something to inspire him to get back on track. 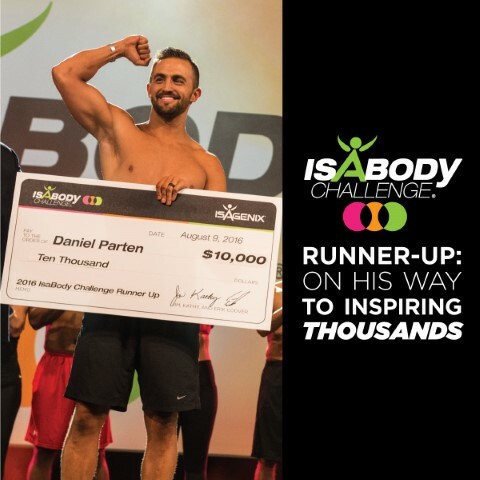 Daniel’s inspiration came in the form of the IsaBody Challenge®. He worked hard and dedicated himself, and after three Challenges, he became the first-ever IsaBody™ Runner-Up at 2016 “One Team” Celebration. “To be chosen was very humbling and incredibly exciting,” he says. Daniel feels that he has gone through a major growth period. He is now able to talk more openly about what happened to his brother and uses IsaBody as a platform to share his story and inspire others. “The IsaBody Challenge has definitely been a big healing process for my family,” he says. Another area of Daniel’s life that has grown since being named Runner-Up is his Isagenix business, which he and his wife do together. He spends time on his business every day, which is a big contributor to the success he’s experienced to date, but being named the IsaBody Runner-Up doesn’t hurt either. Time management and self-discipline are key to his success, both in the gym and in his business. He stays organized conducting coaching calls, connecting with potential, new customers, and following up, but he also maintains discipline with his diet and workouts. Eating five to six meals per day—two or three of them being IsaLean® PRO Shakes—helps him stay on track. Recently, Daniel added Cleanse for Life® to his daily regimen, setting aside one or two days a month to cleanse. In the evenings, Daniel makes sure to “unplug” from his workday, taking time to focus on his wife and baby girl Denver. With his sights set on the future, Daniel is thinking big. He is jumping in feet first with the 90-Day Game Plan, helping others launch their businesses. He will be representing IsaBody at future events, and of course, New Year Kick Off and Celebration, and he hopes to inspire and connect with tens of thousands of people through his platform. Earning levels for Isagenix Independent Associates depend on time and commitment and may vary. For more information, visit IsagenixEarnings.com. *Rank current as of 9/19/16.